View a copy of our recent newsletter, here. Enter this quarter’s newsletter contest, here. Contribute to our quarterly member survey, here. This year’s meeting will be FREE and no tickets are required. 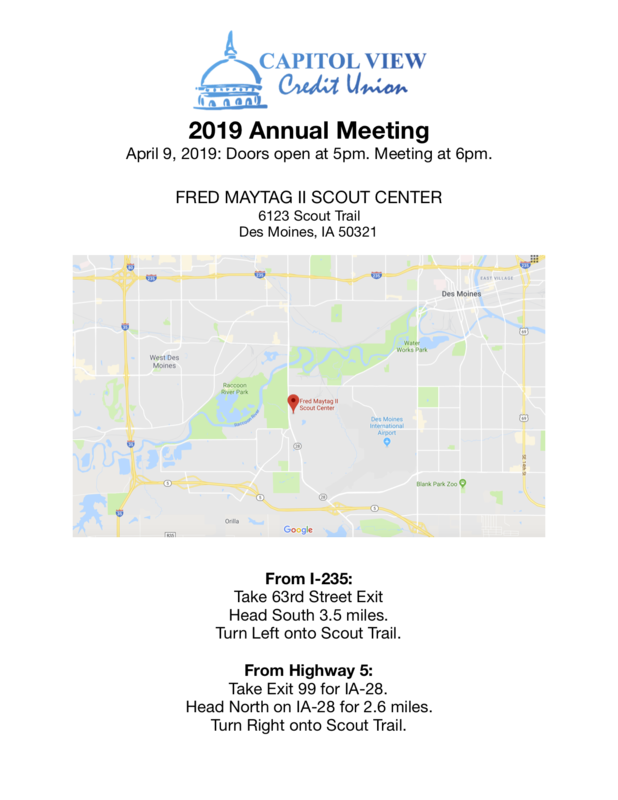 The Capitol View Credit Union annual meeting will be held on Tuesday, April 9, 2019 at the Fred Maytag II Scout Center located at 6123 Scout Trail, Des Moines, IA. Doors will open at 5pm to get checked in and vote. Free pizza and drink will be available so no tickets are necessary. The business meeting will start at 6pm, followed by drawings for cash prizes. If you are unable to attend the annual meeting, absentee ballots will be available beginning the week of February 11, 2019. Contact the credit union office for an absentee ballot for this year’s board member elections. Help us celebrate 75 years of service!